What is the difference between traditional ROM and DynaROM? Traditional ROM provides only the endpoint value. Without evaluating the muscles guarding component, this measure lacks sensitivity to true pain. With DynaROM, range of motion and muscle guarding are graphed throughout motion using dual inclinometers and attached electrodes, improving sensitivity to pain. 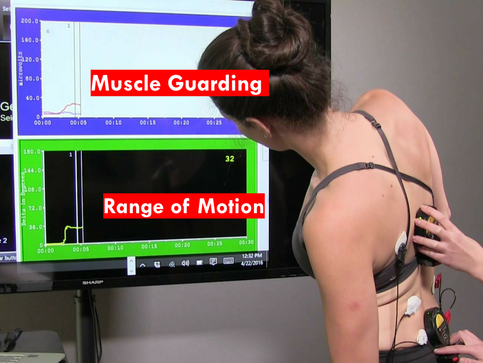 Simultaneous measurements of muscle guarding and range of motion. Graphing simultaneous muscle guarding and ROM can prove the presence or absence of soft tissue injury, even when ROM and MRI results are normal.